« Do more boys than girls learn brass instruments? MusicSmart pianists will be playing live at two wedding Fayres in September. Please come along if you would like to meet us and hear us play. The first is on Sunday o3.09.17 at Fontwell Park BN18 0NS 11.00am-3.00pm and we are also at the Spread Eagle Hotel, Midhurst GU29 9NH on Sunday 17.09.17 from 11.00am – 3pm. 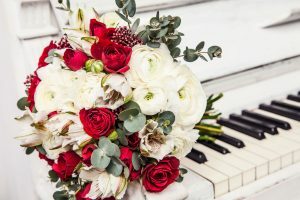 Full details and prices of MusicSmart Wedding Pianist Packages can be found here. If you would like to have a free telephone or personal consultation please contact us. We would love to hear from you. “We can’t recommend Paula highly enough. We planned our wedding on relatively short notice and we were so lucky that she was available. Paula was forever the professional from start to finish. Her communication was faultless and she met with us on a number of occasions in the run up to our wedding. This definitely helped to calm my lovely wife’s (then fiancée’s) nerves. Not only is Paula one of the most skilled pianists we’ve ever met, she is also the friendliest person you are ever likely to meet! Her advice and guidance was invaluable!